Explore the beauty sunrise of Mount Bromo in east Java from the Love Hill Bromo. 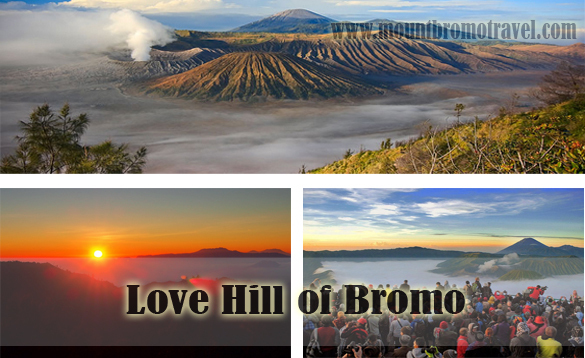 Love Hill of Bromo or Bukit Cinta Bromo is an alternative place to see the stunning beauty of sunrise on Mount Bromo. Just like King Kong Hill, the Love Hill spot is also less well-known than the main spot named Puncak Penanjakan 1 (climbing summit 1), where the most clear view of sunrise on Mount Bromo can be gotten from this spot. However, if you think that Puncak Penanjakan 1 is too crowded of other tourists, you can choose Love Hill as a good alternative besides the Puncak Penanjakan 2 and King Kong Hill. Where is the Location of Love Hill of Bromo? Love hill of Bromo is located about 5 kilometers from the summit of mount Penanjakan 1 and it is also close to the peak of Penanjakan 2 of Bromo. Besides as an alternative view point of Bromo, it is also a popular layover area for the tourists that have known about this spot and those who come back from viewing point on Puncak Penanjakan 1. If you also have been viewed the amazing beauty of sunrise on Mount Bromo from Puncak Penanjakan 1 view point, you can ask the Bromo Jeep rental driver to stop in Love Hill and other alternative viewpoints. You will get amazed of the Mount Bromo beauty viewing experience from the different spots. Take some pictures of the gorgeous mountain and the surrounding nature for some memorabilia. Mount Bromo is one part of Bromo Tengger Semeru National Park with the awesome surrounding natural beauty has been well known as a must-to-visit tourism destination worldwide. It makes Mount Bromo is always fully crowded on holidays, especially on the main view point of Puncak Penanjakan 1. You should come to the viewing spot in early dawn. Otherwise, the location will be fully crowded by the other tourists, because most tourists must choose it as the first place for sunrise viewing. If you think that you have been too late, then you can choose the Love Hill of Bromo, King Kong Hill and Puncak Penanjakan 2 as the alternatives of view point to see the Bromo sunrise. Actually, the alternative viewing spots also give amazing views of Mount Bromo Sunrise. However, most tourists choose Penanjakan 1 as the first spot to enjoy the sunrise view. Therefore, make sure that you wake up early if you want to enjoy the Bromo Sunrise in the most amazing view. Hopefully, you are fortunate enough to see the amazing beauty completely without any cloudy weather that closes the view. But when you find the main viewing spot has been fully crowded, just go to the Love Hill of Bromo as the alternative place to see the sunrise.